The Cathedral is built in the traditional Byzantine style of architecture, which dates back to the sixth century, A.D.. This style of architecture incorporates a floor plan of a Greek cross, which is a cross whose arms are of equal length. A dome is strategically placed where the arms of the cross meet. The size of the dome varies from church to church, some are so large that the entire church appears circular from the outside. In addition to this central dome, some Byzantine churches also have smaller domes in either two or all four corners of the church building. 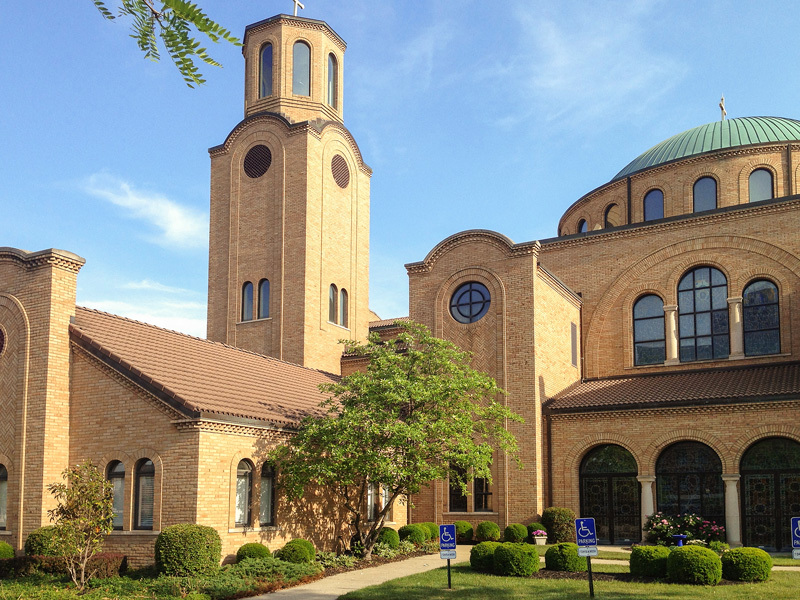 Welcome to the Annunciation Greek Orthodox Cathedral of Columbus, Ohio, a member of the Eastern Orthodox faith. The Cathedral is built in the traditional Byzantine style of architecture, which dates back to the sixth century, A.D.. This style of architecture incorporates a floor plan of a Greek cross, which is a cross whose arms are of equal length. Byzantine churches are characterized by exterior and interior splendor.The chief goal of the Byzantine style is to create an atmosphere of worship, to elevate the mind and soul of the worshipper towards heaven, towards the kingdom of the God he has come to worship and glorify. A great deal of symbolism and meaning exists within the architecture of the Cathedral. Everything one sees has a special meaning and purpose. It is the embodiment of the Orthodox heritage and it serves as a constant reminder of our living Orthodox tradition. The architecture and art of the Cathedral speaks volumes on the Orthodox faith and on the relationship that exists between God and man. The first stop for an Orthodox Christian upon entering the church is in the candle room where he/she will “sacrifice” a candle and venerate the icon depicting the Saint of the day or season. The candle symbolizes Christ the Light of the World who was sacrificed for our sins. The wax of the candle remind the Orthodox of the human soul. The wax of the candle is cold and hard prior to being lit, but after the candle has been lit and has sat in the church, the wax becomes warm and pliable. In a similar manner, our human soul is also cold and hard when we first enter the church from the outside world, but yet it warms and becomes pliable as we sit in church worshipping God. The candle room is located in the area of the church known as the narthex, which is separated from the rest of the church by a wall with windows. It was to the narthex that the catechumens (those who were studying, but as yet uninitiated in the faith) would depart following the conclusion of the Service of the Catechumens in the Divine Liturgy. The exhortation for the catechumens to depart is still made by the Priest in the Divine Liturgy with the words “…the doors, the doors, in wisdom let us attend”. The main or central portion of the Cathedral is known as the nave, from the Latin word “navis” which means ark or ship, because to the Orthodox, it is in this ark or ship of the church with Christ at the helm that they will be lifted into heaven. The most prominent Icon of the Pantocratorfeature of the nave and the highest point of the Cathedral is the dome. It is not a coincidence that at this highest point in the center of the church building, a special place is reserved for one of the most meaningful symbols of our Orthodox faith, the image of the glorified Christ reigning on His heavenly throne, the icon of Christ Pantocrator. 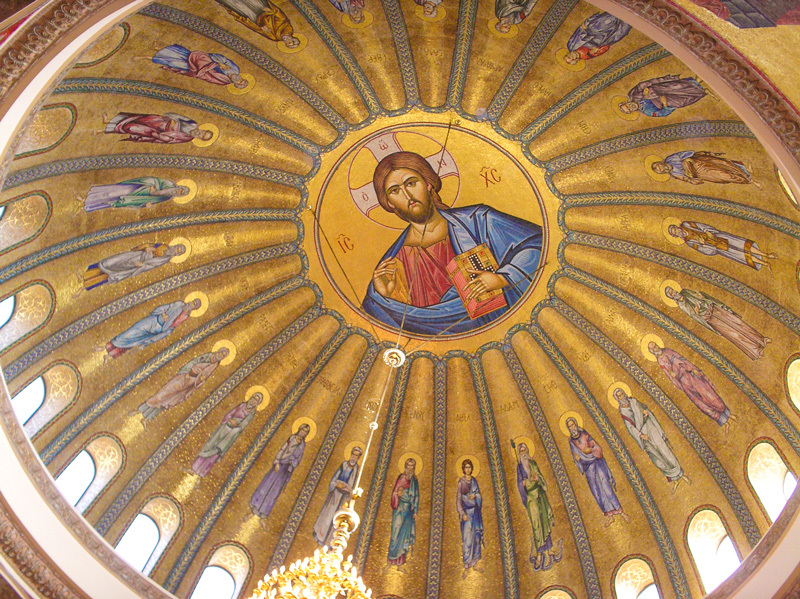 The image of Christ Pantocrator in the dome is not of a weak, vanquished God, but rather of an invincible Christ, whose victory over death through His life-giving resurrection re-opened the doors for our salvation. Doors that we had closed through sin. God is not weak, He is Pantocrator which means literally “in control of everything”. The figure of the Pantocrator gives full expression to the victory hymn of the early Church as quoted by St. Paul, “He emptied Himself taking the form of a servant….and became obedient unto death, even death on a cross…Therefore God has highly exalted Him (lifted Him up) and bestowed on Him the name which is above every name, that at the name of Jesus every knee should bow, in heaven and on earth and under the earth and every tongue confess that Jesus Christ is Lord, to the glory of God the Father”. [Phil. 2:7-11]. Christ the Pantocrator is suspended above the center of the Church as a reminder to us of God’s all-pervading presence in the Universe. It is a constant reminder to us that God is always with us, watching over us, hearing our prayers, responding to our petitions, not just on Sundays, but every day of our lives. Surrounding Christ the Pantocrator, between the rays of His divine energies, 24 Old Testament Patriarchs that figure into the genealogy of Christ are depicted. “And round about the throne were four and twenty seats; and upon the seats I saw four and twenty elders sitting, clothed in white raiment; and they had on their heads crowns of gold.” [Rev. 4:4]. The genealogy in the dome begins at the eastern most point with Adam (who is depicted as standing on the snake) and continues to Abraham. The order of the Patriarchs beginning directly to the right of Adam is as follows: Seth, Noah, Cainan, Mahalalel, Jared, Lamech, Shem, Japheth, Arphaxad, Sala, Heber, Saruch, Nachor, Thara, Abraham, Isaac, Jacob, Phalec, Ragau, Methuselah, Enoch, Enos, and Abel. Unlike the other three evangelists who are depicted by themselves, two people are depicted in the icon of St. John, reminding us that John did not write his gospel, he dictated it to a scribe (Deacon Prochoros). The mosaics within the Cathedral consist of roughly 5 million tiles of Venetian glass, marble and 24-carat gold sandwiched in a thin layer between two pieces of glass. They are the work of an Italian artisan. The main stained glass windows on the upper portion of the Cathedral on the north side (the left as one faces the altar) depicts the nativity of Christ, with the baby Jesus laying in the manger, the star of Bethlehem shining down on the manger and on the reclining Mary and the angel announcing to the shepherds on the right the good news of Christ’s birth. Above the exit door to the left of the baptismal scene St. Catherine is depicted and St. Barbara is depicted above the exit door to the right. St. Catherine is depicted in front of a spiked wheel on which she was tortured for her faith. Catherine was a woman of high rank and learning, who after being tortured on the wheel, was beheaded by the Roman Emperor Maxentius, for her protest and refusal to worship the idols of the state. St. Barbara is depicted with a quill in her hand. The tradition of the Church holds that she was a well educated daughter of a rich and well known pagan named Dioscoros who, after learning of his daughter’s conversion to Christianity, beat and tortured her in an attempt to force her to abandon her faith. Despite her suffering, Barbara held firmly to her faith in Christ, enraging her father to the point that he finally beheaded her with his own sword. Her martyrdom has served as an example of true faith and commitment for countless generations of Christians. The main stained glass windows on the upper portion of the Cathedral on the south side (the right as one faces the altar) depicts the Icon of the Descent into Hades. Christ breaking down the doors of Hades with His glorious resurrection, lifting up the souls of Adam and Eve from the abyss of death and freeing the captive souls of the righteous from the chains and locks that bound them. The stained glass window below the Descent (floor level) depicts St. George the dragon-slayer. Above the exit door to the right of St. George is a stained glass icon of St. Athanasios and St. Nicholas is depicted above the exit door to the left of St. George. The stain glass windows found in the back right corner of the nave depict St. Kosmas (on the left) and St. Damian (on the right). In the back left corner of the nave, the icons of St. Nectarios (on the left) and St. Demetrios (on the right) can be found. Beyond the nave, between the front-most pew and the altar of the Cathedral, is an area known as the Solea. It is here where all the sacraments of the church are administered. The distinctive features of this area include the baptistery in the northeast corner (far left corner, as one faces the altar), the pulpit, the chanter stand on the right and the throne of the Bishop. The wooden structure in the southeast corner is called the “kouvouklion”, which is used once a year on Holy Friday and represents the Tomb of Christ. The stained glass windows behind the kouvouklion depict St. Paul (on the right) and St. Anthony (on the left). St. Anthony, who is depicted in monastic garb, is often regarded as the first monk and the founder of monasticism. The baptismal font in the area of the baptistery is symbolic of a womb emphasizing that the sacrament of Holy Baptism is a rebirth, a resurrection of the infant into the life and faith of the Church. The stained glass windows in the baptistery depict Sts. Constantine and Helen (who was Constantine’s mother). Sts. Constantine and Helen are depicted standing in front of the cross of Christ which tradition holds Helen found under a bush of Basil. The pulpit symbolizes the stone which was used to seal the tomb of Christ. The throne of the Bishop is a historic remnant of the Byzantine empire where it was used by the royalty of the land. It has remained in the modern Orthodox church as the throne of the visiting royalty of the Church, the Bishop, the Archbishop or Patriarch. An icon of Christ the High Priest is depicted on the throne back. There are two thrones installed in the Cathedral. The second throne is located in the altar directly behind the altar table. This is typical in Cathedrals. The center of everyone’s attention as they sit in Church is the altar itself and the mosaic of the Virgin Mary in the apse of the altar. The altar is separated from the nave of the Orthodox church by a wall ornamented with icons. This icon screen or iconostasion has a dual meaning. First, it reminds the Orthodox of the partition which separates heaven (symbolized by the altar) and earth (as symbolized by the nave). Secondly, it serves as a reminder of the incarnation of Christ, because it was in the incarnation of Christ that heaven and earth met and in the architectural symbolism of the church, the icon screen is also a place where heaven and earth meet. All Orthodox churches have icon screens and while they vary in degrees of detail and intricacy all must conform to a general scheme. In this scheme, the first icon panel to the right of the altar will always depict Christ. The second icon panel will always depict St. John the Baptist.The first icon panel to the left of the altar will always depict the Theotokos or God-bearer (the Virgin Mary with Christ child). The second icon panel on the left will vary from Orthodox church to Orthodox church for it depicts the patron saint of the Church. 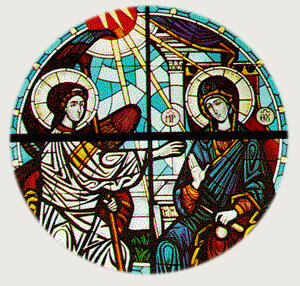 We are the Annunciation, so you see the Archangel Gabriel announcing to Mary that she will bear Christ and the Holy Spirit in the form of a dove descending down upon her. An icon of the Last Supper is depicted in the arch above the royal doors. The royal doors are brass and contain medallions depicting the four evangelists in the forms of the animals described in the book of Revelations 4:7-8 (described earlier in this text). A door to the far right opens into the vestry and a door to the far left opens into the Table of Oblation, where the prepatory service is held. In most churches, these two side doors have icons of the Archangels Michael and Gabriel, who minister unto God and serve as guards of the Sanctuary. The icons of the Church serve as constant reminders that the Orthodox Church is a Church of the living. We do not worship alone, but rather all the members of the Church Triumphant in Heaven, in other words, all the saints, martyrs and early Church Fathers are present with us each Sunday, praying and worshipping to God “for He is not a God of the dead, but of the living, for all live unto Him” [Luke 20:38]. The icons remind us that with Christ Pantocrator, there is no death, but only eternal life. A couple of points should be noted about the altar area. The first is that it faces the East. All Orthodox altars, unless physically impossible for the building, always face the East, facing the rising sun which represents Christ the light of the world. In addition, the altar is elevated from the floor of the nave by a set of steps. The floor of the Cathedral symbolizes the earth, the ceiling the universe with the stars and planets represented by the chandeliers. The altar symbolizes heaven which lies somewhere between the earth and the universe and is thus elevated by steps as a reminder of this relationship. The main chandelier that hangs from the dome has 236 lights on it and is gold plated. The pendant at the bottom of this chandelier depicts one of the six-winged angels, the “Seraphim” that are described by the prophet Isaiah who saw them around God’s throne. Main Chandelier There are 35 companion chandeliers that illuminate the rest of the Cathedral and are made of solid brass. The pendants on the companion chandeliers depict the double-headed eagle, which was the symbol of the Byzantine Empire. All the chandeliers were imported from Greece. 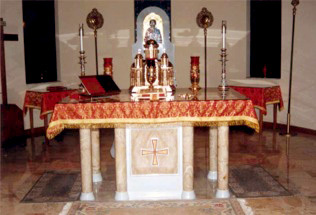 A gold tabernacle rests on the altar table (known as the “Holy Table”) in the middle of the sanctuary. It contains the Holy Gifts, the Body and Blood of Christ which are consecrated each year on Holy Thursday and placed in the tabernacle. The Holy Gifts contained in the tabernacle are reserved for use in emergencies or visits to the sick and the infirm who cannot attend the liturgy, but they are not Annunciation Altar used during the liturgy.A votive light known as the “eternal light” burns constantly in front of the tabernacle as a reminder of the presence of Christ, the Light of the World in the tabernacle. In addition to the tabernacle, a gospel book is always enthroned on the altar table and is ornamented with a gold or silver covering. On one side is depicted the Crucifixion of Christ and on the other side, His Resurrection. The gospel book contains excerpts from the four evangelists whose icons are depicted individually on each of the four outside corners. The altar table symbolizes the tomb of Christ and is made of marble. Entombed within the altar itself is a relic of a Saint or Martyr which is installed during the church’s consecration. A small alcove can be partially seen to the left of the altar table, which houses the Table of Preparation where the prepatory service of the liturgy is held. It is here where the elements of bread and wine for the Sacrament of Holy Eucharist are prepared before the Divine Liturgy. The alcove represents the manger of Bethlehem and usually holds an icon of the Nativity. The service of preparation is purposely hidden in the alcove as a reminder that Christ was also hidden from the world for most of His young life, while He prepared Himself for His ministry. Icon of the Platytera In the half-dome behind the altar in the apse of the Cathedral is a mosaic icon of the Virgin Mary with the Christ child. This icon is known as the “Platytera Ton Ouranon”, which translates into “more cosmic than the heavens” in reference to the fact that Mary contained within herself Christ, the Creator of the heavens. 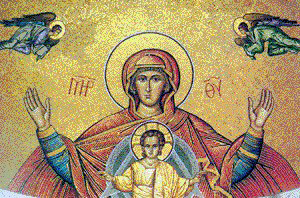 In the icon, Mary spreads her arms out wide as an invitation to all of us to come and accept her Son as our personal Savior and as a petition to us to allow Christ to work in our lives as He has in hers. 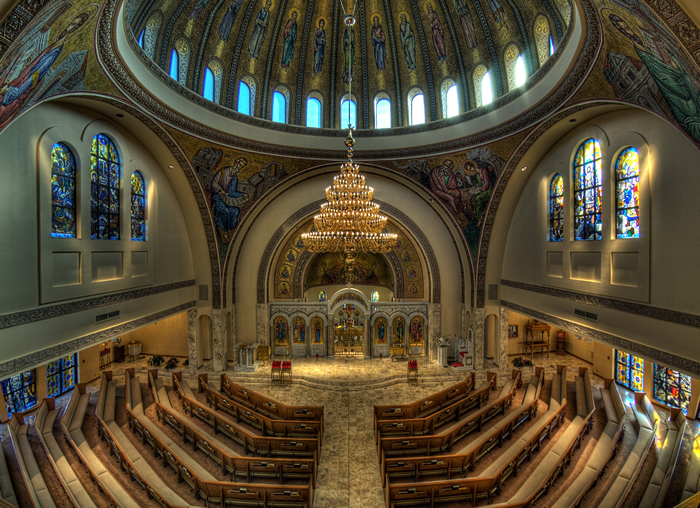 In the back wall of the altar, below the icon of the Platytera are stained glass windows depicting three hierarchs of the Eastern Orthodox church, Sts. Basil, Gregory and John. The twelve disciples of Pentecost are depicted in the arch surrounding the Platytera. This is a brief glimpse into the symbolism of an Orthodox church. 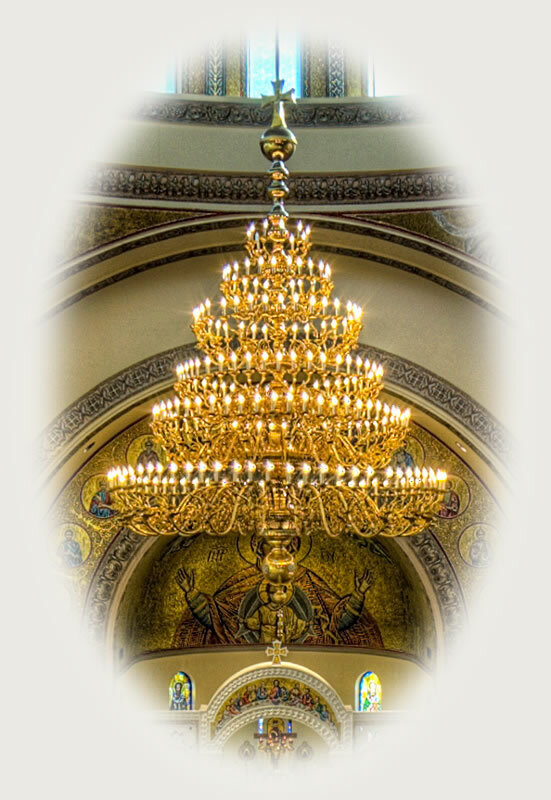 Yet even in this short journey through the Cathedral, it should be clearly evident that everything one sees within an Orthodox church is there to serve as an aid in our Orthodox worship of God, to serve as a constant reminder of our Orthodox Christian heritage and tradition, and to help us understand and comprehend the message and truth taught to us by Christ and the Apostles. My Great Grandfather "The Brave Sultan"
This is a weblog or "blog" journal. Our thoughts and opinions change from time to time…We consider this a necessary consequence of having an open mind. This weblog is intended to provide a semi-permanent point in time snapshot and manifestation of the various memes running around our brains, and as such any thoughts and opinions expressed within out-of-date posts may not be the same, nor even similar, to those we may hold today. Copyright 2017 All Rights Reserved by Babak Darvish. Simple theme. Powered by Blogger.